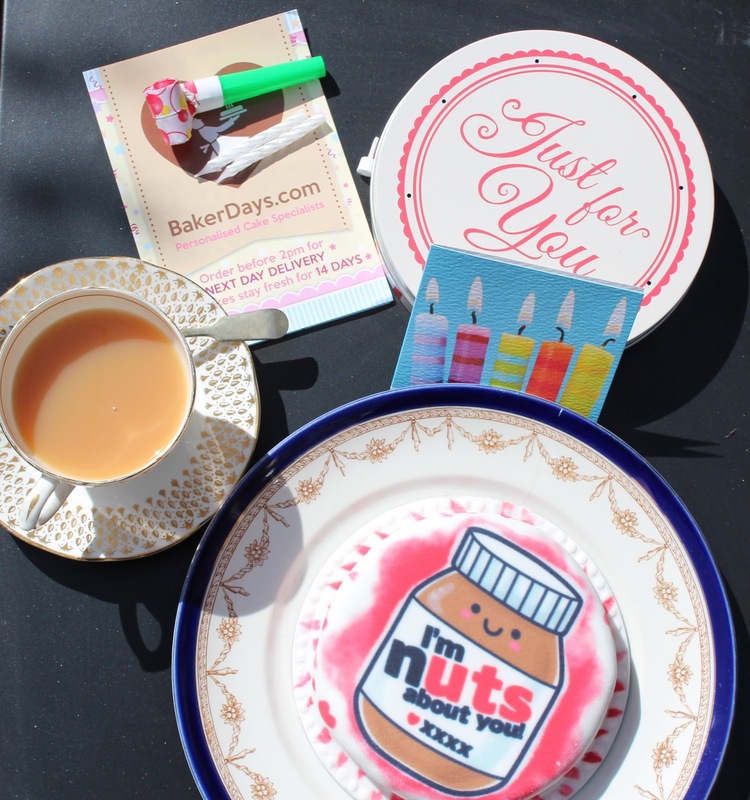 Earlier on this month I was lucky enough to be sent a lovely package by BakerDays. I’m sure somewhere out there in the bloggersphere you’ve seen a few reviews of their treats already but I wanted to share my thoughts on their service with you all. I’m not particularly a lover of cake…in the past I’ve had some pretty horrid dry cakes that have put me off.. but OH how things have changed thanks to Bakerdays. Before the cake arrived I was really intrigued to see how a delicate little thing would make it here in one piece, it would have been rather disappointing to get a tin full of crumbled up cake covered in sweaty icing eh? When the box arrived I quickly delved in to see how they package it all up.Cleverly they ensure that the icing fully covered all the cake and a bit of the base and then packed it securely into a cute little breathable tin. There are also instructions about how to remove the cake from said tin just incase you cant work it out. As we haven't got any birthdays or celebrations to celebrate at the moment I had a browse of the more generic cake designs. I found this really cute “I’m Nuts About You” design. I chose to just put some XXXX instead of someones name.. it isn’t really very me to be a soppy bugger. This service is ideal for someone who, like me, is pretty crap at remembering birthdays, the package also provided some really handy party accessories- 2 balloons,2 candles,a cute little birthday card and one of those things you blow on and the end pops out and makes a PPFTTT noise.... what are these called?! Once I'd got the cake out of the tin I thought it'd be rude not to have a mini tea party on my own in the garden. I poured myself a lovely cup of Yorkshire Tea and sat down to slice open that cute little cake. I, at this point, had no idea what type of cake was under the icing but hoped it would be chocolatey and rich. Actually... thats a lie... before I sliced into the beauty I sat for a couple of minutes sniffing the delicious icing- it reminded me of being a kid and the cakes you used to get at birthday parties, so sweet and lickable. Ohhhh how pleased I was to see this chocolatey sight... can you see the gooeyness of it around the edges too? YUM. This one is the chocolate gateau cake with chocolate buttercream. This cake is by far THE best cake I've had in a good while.. its gooey goodness really complimented the slightly chewy sweet icing and I couldn't help but have a second bit soon after the first. By the end of the day both the Mr and my friend Sally also agreed that its a really good quality cake. Especially as its been through the postal system. I love the concept of BakerDays- any excuse for me to avoid having to bake a cake is great in my eyes. The cake was moist (my fave word btw) chocolatey,just the right size for three greedy people,reasonably priced (£14.99) and the most important thing..very easy to have ready for a birthday/special occasion you've forgotten about! Deliver by 2pm and have your cake with you the next day! They do a whole range of cakes for all occasions- birthdays,christenings,valentines,congratulations,new baby,mothers day... you name the celebration they've got a cake for it. They also have a variety of different types of cakes to choose from- gluten free, fruit cake,vanilla sponge,dairy free- they also come in a variety of sizes to suit your celebration needs! As well as letterbox cakes they do cupcakes and full photo cakes in larger sizes! Have you tried BakerDays yet?